Here are some publications from the project team. If you would like copies of the any of the material listed below please let us know. Jones, R. Pykett, J. Whitehead, M. (forthcoming) ‘The geographies of policy translation: how nudge became the default policy option’ Environment and Planning C: Government and Policy. Pykett, J. Jones, R. and Whitehead, M. (2014) ‘The Art of Choosing and the Politics of Social Marketing’ Policy Studies. Jones, R. Pykett, J. and Whitehead, M (2013) ‘Behaviour Change policies in the UK: an anthropological perspective’ Geoforum 48: 33-41. Jones, R. Pykett, J and Whitehead, M. (2013) Changing Behaviours: On the Rise of Psychological State (Edward Elgar). Whitehead, M. Jones, J, Pykett, J. and Welsh, M. (2013) ‘Neuroliberal Climatic Governmentalities’ in Bulkeley, H. and Stripple, J. eds. Governing the Global Climate: Rationality, Power and Politics (Cambridge University Press). Jones, R. Pykett, J. and Whitehead M (2013) ‘Psychological Governance and Behaviour Change’ Policy and Politics 41: 159-182. Whitehead, M. Jones, R, Pykett, J. and Welsh, M. (2012) ‘Geography, Nudgeocracy, Neuro-politics’ Geographical Journal. Howell, R.A. (2011). ‘Lights, camera … action? 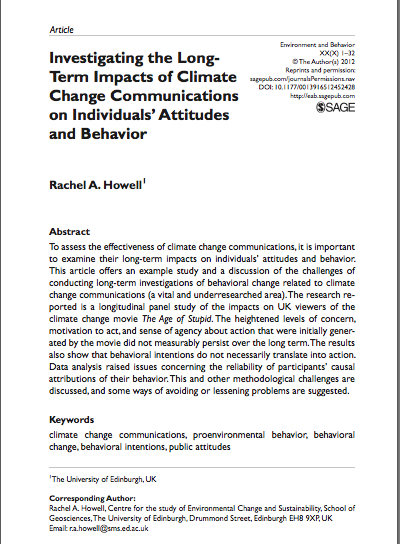 Altered attitudes and behaviour in response to the climate change film The Age of Stupid’ Global Environmental Change, 21(1):177-187. Whitehead, M. Jones, R. and Pykett, J. (2011) ‘Governing Irrationality, or a More-Than-Rational Government: Reflections on the Re-scientization of Decision-making in British Public Policy’ Environment and Planning A.
Pykett, J. Jones, R. Whitehead, M. Huxley M. Strauss, K. Gill, N. McGeevor, K. Thompson, L. Newman, J. 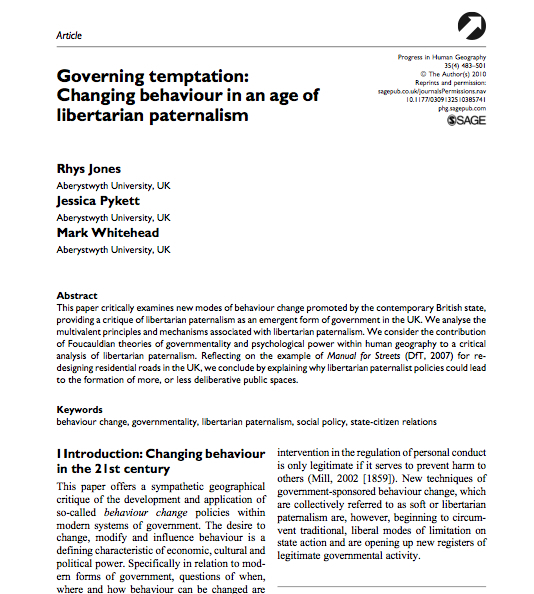 (2011) ‘Interventions in the political geography of ‘libertarian paternalism’ Political Geography pages 1-10. Jones, R. Pykett, M. and Whitehead, M. (2011) ‘The Geographies of Soft Paternalism: the rise of the avuncular state and changing behaviour after neoliberalism’ Geography Compass. Howell, R.A. (2009). ‘The Experience of Carbon Rationing Action Groups: Implications for a Personal Carbon Allowances Policy’ UKERC Final Report. (Environmental Change Institute, Oxford).